As part of the European Voluntary Service (EVS) organized by the European Erasmus + program. 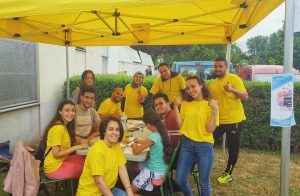 We volunteered in the city of Strasbourg for a period of one month (July) under the supervision of the Association Association of Migration Solidarity and Development Exchange Association AMSED. We are responsible for producing a final report that includes the various important points that we experienced during our training. In this report I will tell all my motivations that pushed me to participate in this experience, my achievements, my feelings and my acquired skills. I am Younes CHKOUKOUT native of Tinghir a small town in the south-east of Morocco the poorest region in the country, a marginalized zone, in this region a stagnation dug around all dimensions (economic, social, political …) it is therefore necessary for its young people to mobilize to support it with their skills and experiences. For my university studies, first I was a scientist I had obtained my bachelor’s degree in physical sciences and chemistry, under the effect of several reasons (economic, social, physical and personal) I enrolled in the law school where I obtained my degree in economics and management (option management of companies) after I turned to social development, I took my professional license in Social Development Agent (ADS) and then my master’s degree in IPESS Project Engineering in Social and Solidarity Economics at the Cadi Ayad University of Marrakech (Morocco), the choice of my university course is in direct relation with my final objective which is the obligation to bring an added value to my region because for me the social field is the closest to support marginalized areas and people. I belong to several associations either in Tinghir with the association of our district (Tagoumaste Association for the Development) and with a network which gathers several associations of the city of Tinghir (Networks of Associations of Tinghir for Development and Democracy, RATDED) and I am also a member of my sending association Espace Solidarité et Développement, while working together on small projects, but for me these experiences remain modest and insufficient. 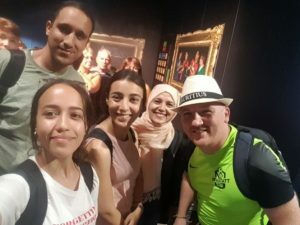 That’s why I decided to enrich my associative experience I took the opportunity to participate in the Erasmus Plus program through the AMSED with which we shared wonderful moments. Participating in this training that took place during the month of July abroad allowed us to go out of our system to realize that there are thousands of possibilities for each person to do their part in the process. process of development, in addition I wanted to participate to develop my communication techniques by coming into contact with other young foreigners to my culture. I met several people with different nationalities, with a cultural diversity, we shared our ideas together. 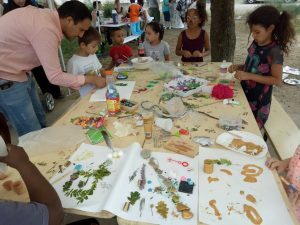 The aim of this volunteer project is to offer interactive and intercultural activities through street entertainment for children and young people in the so-called disadvantaged neighborhoods of Strasbourg. It aims to promote cultural exchange through music lessons with traditional instruments, dances, participatory workshops, etc. The purpose of this EVS is also to improve the key skills of young people who have the opportunity to promote their inclusion and participation in society through different digital activities. We were young volunteers and we had good times together with the AMSED team. In our first week in Strasbourg, the AMSED team managed to welcome us and give us the necessary information to mobilize easily in different places of the city. On the first day a member of the AMSED accompanied me to settle in the AMSED apartment that he was well equipped. On the second day and after the arrival of the EVS, we visited the headquarters of the AMSED, we did a tour within the AMSED to discover the different officials with their missions in the Association then we made a meeting with the director of AMSED to focus on the essentials during our stay. Immediately after the meeting, we were accompanied to prepare the transport cards (Tram and bus) and the start of activities. For partners of AMSED (ARACHNIMA, Social and Cultural Center of Hautepierre, etc) we worked in collaboration with our partners in the outskirts of Strasbourg in the different disadvantaged neighborhoods where I led workshops with several activities, several themes and this for me is the first experience abroad. I had a very rich experience especially with the team of CSC Hautepierre, we had a meeting with the leaders of the children’s home to talk about all the activities to be programmed and also the different details about our partnership. It is also the case with the ARACHNIMA we had reserved the first meeting for the discussion of programs and the use of time. Then a job for the activities was realized thanks to the person in charge of the activities of AMSED. For EVS we were able to form a good, consistent team. 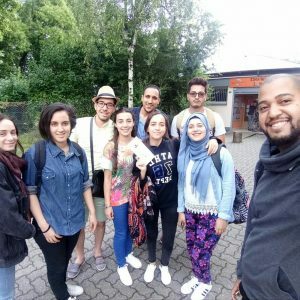 We were four Moroccans and we saw misunderstandings sometimes but it happens once and immediately we put things like nothing happened, the good times cover all this, we visited together beautiful sites either in Strasbourg or in Germany. Good memories engrave on our brains. Throughout our training tasks are divided among us in a balanced way each volunteer has to do a job while building our success together, the factor of cooperation and solidarity are always present. We started on the third day with a meeting with our partner ARACHNIMA in Wattwiller to set the starting time for the whole week, then directly after the meeting I hosted with my colleague Mohammed the Arabic calligraphy workshop has targeted the children of this district, this artistic activity aims to discover the aesthetics of Arabic calligraphy for all participants. 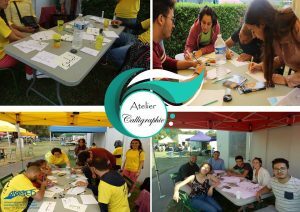 We kept the same activity of the workshop for the next day, the children liked to see their names in Arabic calligraphy. Always in collaboration with the ARACHNIMA, Push the children to freely express what is the Right of the man, it is the workshop for the day after led by Lily, laila and me, it was for the objective to put children in situation to explain the basic concepts of Human Rights through the drawings using colored markers. This activity allows to develop the imagination in children in the field of human rights. Compared to the team of social and cultural center of Hautepierre CSC, we organized a meeting to set up our partnership and discuss our program and the time use at home of the childhood and the family of Hautepierre was the 06/07/2018. In our first two days with CSC Hautepierre, Moi and Mohamed led a workshop dedicated to board games, it was intended to ensure the awareness of participants, develop their ability to focus and improve their reaction. We took advantage of these days to observe and find out what are the favorite activities in children to prepare them for the rest of the days. For the following days, we organized workshops on painting that are intended to develop the creativity and curiosity of the child. Always in collaboration with the Social and Cultural Center of Hautepierre an opportunity to seize to discover our sports skills and to diversify the activities, under the proposal of CSC to work on the theme Olympic Games throughout the week from 16 to 21 In July, I played a game of bowling that requires the presence of a concentration, to balance, target a target or throwing projectiles and roll. This activity aims to encourage neighborhood children to play in a competitive atmosphere with a high level of concentration and play alongside other children. On the other hand, among the proposed activities there is that of the land art which is considered a trend of contemporary art using the framework and the materials of the nature (wood, earth, stones, sand, water, rock , etc.). Most often, the works are outdoors, exposed to the elements, and subject to natural erosion. Each of the participants in the workshop started to make their own magical garden, they enjoyed these activities that develop their imagination. Apart from the activities we did in collaboration with our partners, we were responsible for spending the mornings at AMSED to work on the other tasks related to our training, to follow the Facebook page, to report on the activities carried out each week, to develop the technical data sheets of the workshops, photo montages of the activities, the microfilms of the activities … each one of us takes a responsibility to carry out its own tasks. For the Nino workshops which are very interesting, we booked a morning in each week for communication, theater and discussion of various topics. We took advantage of these meetings to share our ideas, our points of view with other colleagues. It was an opportunity to discover different cultures, different ways of thinking. We are lucky to benefit from EVS, we had a very rich experience with AMSED in Strasbourg, we took advantage of our opportunity to visit the most possible places in Strasbourg. Not to mention the visit of Park Holiday Park in Germany with the team of CSC Hautepierre, we had an unforgettable day, it was very beautiful. Personally I am convinced that the trip changes the way of thinking then the way of living it opens the mind on what is happening elsewhere, on the way and conditions of living among foreigners. This experience has brought me a lot of interesting things that I will share with the members of the associations of which I am a part. Finally, I express my deep gratitude to Mr Djilali, Director of AMSED for their efforts and all that he has done for the success of our EVS in Strasbourg, I wish to express my deepest gratitude and gratitude to the coordinator from EVS to Morocco Ghita Chakir that she encouraged me to discover this excellent experience, Thanks RATDED and Lotfi Joudar representatives of my sending Association for their trust, I also want to thank my colleagues EVS Moroccans and Tunisians , a big thank you to the whole AMSED team (Oussama, Lily, Mathilde, Marie, Sonia, Nino and the others) we really had wonderful moments.